How Do the 2016 Nissan Frontier Standard Features Compare? Do the 2016 Nissan Frontier Standard Features Measure Up to a Honda? If you’re on the lookout for an exceptional truck that is loaded with prime features, you may feel confused as you try to determine which of the latest models offer exactly what you’re looking for. Will you get everything you want among the 2016 Nissan Frontier’s standard features, for instance? 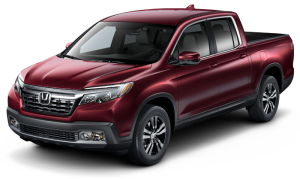 Or does a popular rival like the 2017 Honda Ridgeline offer more? We’ve compared the Ridgeline and the Frontier and the features each of these trucks brings to the road. One of these pickups clearly delivers more than the other in the realm of amenities—keep reading to find out which one pulls ahead! The Honda Ridgeline has garnered widespread attention during the 2017 model year due to its lineup of world firsts. Two of the Ridgeline’s first-in-the-industry amenities are among the various features that come standard onboard the Ridgeline but not the Nissan Frontier. For example, the world’s first dual-action tailgate is one of the 2017 Ridgeline’s standout features that isn’t available on the Nissan Frontier or any other current pickup truck. This pioneering tailgate can open two ways: It can be folded down vertically like any other tailgate, and it can also be opened horizontally like a door. The industry’s very first in-bed trunk is another of the Ridgeline’s standard amenities that aren’t available onboard the Frontier or any other pickup. Integrated right into the bed of each Ridgeline model is a lockable trunk that delivers 7.3 cubic feet of cargo space and even features a drain plug so it can be used as an ice chest. To experience the incredible 2017 Honda Ridgeline for yourself, simply head over to any Central Illinois Honda Dealers location, where a knowledgeable team member will be on hand to go over the Ridgeline’s various features and options and then get you behind the wheel for a test drive. Come in and see us or contact us today! 0 comment(s) so far on Do the 2016 Nissan Frontier Standard Features Measure Up to a Honda?